I think that I am suffering from a little bit of a “Holiday Hangover” . . . I just don’t feel like putting much effort into my dinners right now! 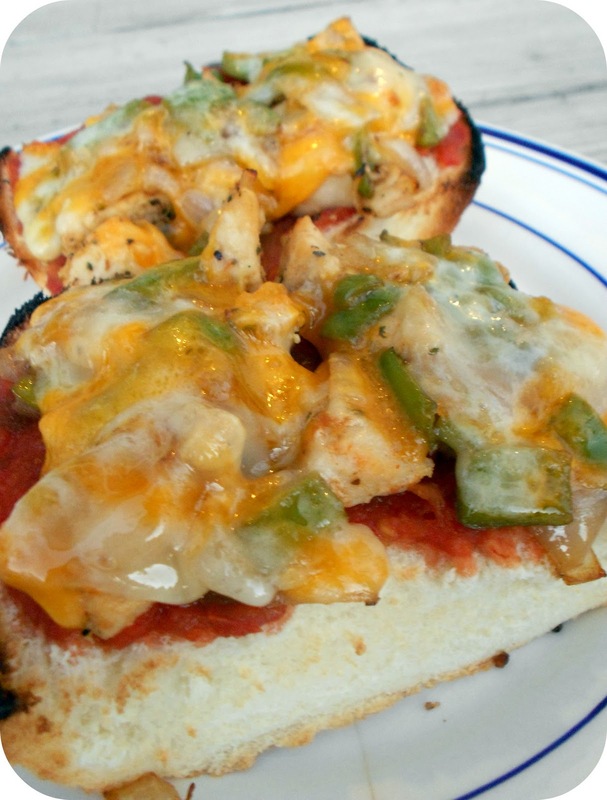 I had some leftover grilled chicken and found this quick and easy recipe over at $5 Dinners. I was so happy that there was so little work on my part, but it was a yummy meal my whole family loved! So if you are looking for a quick and easy dinner (or even lunch), this is perfect! Slice the bread open lengthwise so you have two long pieces. Season the chicken breasts with the fajita seasoning (or taco seasoning) and grill on both sides until cooked through. Saute the peppers and onions with some fajita seasoning for about 3-5 minutes, or until the water has cooked off. To assemble, spread the salsa on the bottom of the bread. Add the grilled chicken slices, then the sauteed peppers and onion, then the cheese slice.